LEXINGTON, Ky. (Monday, Oct. 23) — The push to have equines treated the same as other agricultural livestock, the potential to use the lure of horses to further expand the commonwealth’s considerable tourism industry, the effort to cultivate a trained workforce and how historical horse racing is growing the industry were among the topics examined at the Kentucky Equine Education Project’s second Equine Industry Conference last week. 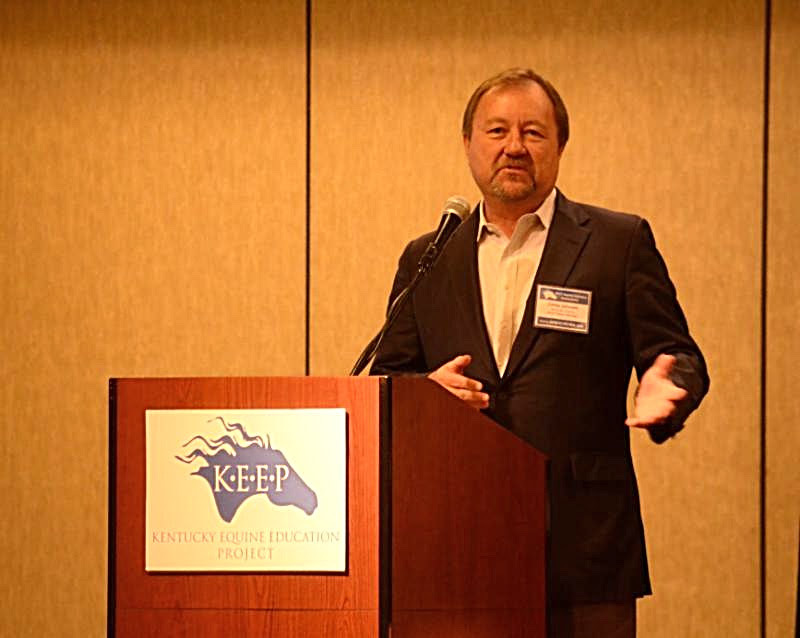 “Our second Equine Industry Conference highlighted many of the most important issues Kentucky’s horse industry faces,” said Joe Clabes, KEEP’s Executive Director. “Bringing industry leaders and policymakers together to discuss how we capitalize on recent gains and address ongoing challenges is critically important to the betterment of the Commonwealth’s signature industry. 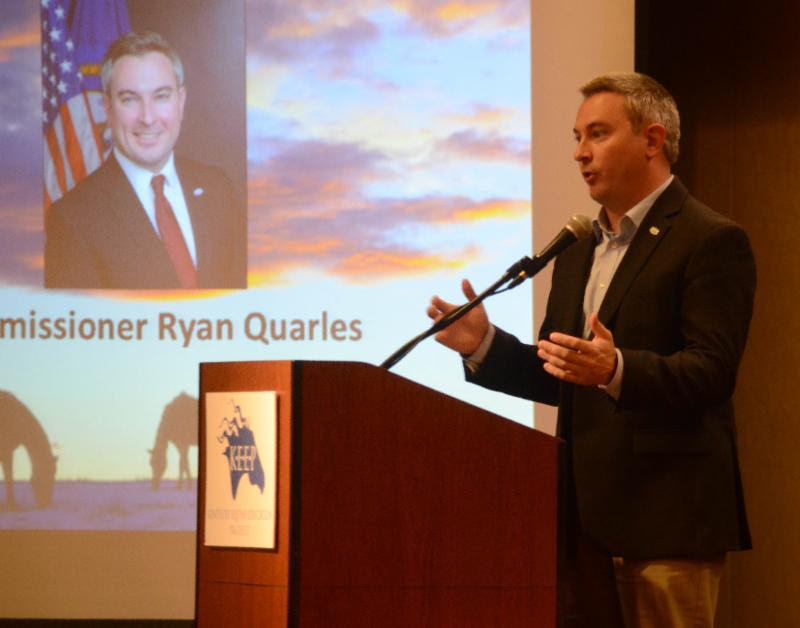 Kentucky Commissioner of Agriculture Ryan Quarles stressed that the Kentucky horse industry “is about family farms,” using as an example KEEP board member Fred Sarver’s saddlebred farm in Carlisle. Quarles noted that while he grew up on a tobacco and cattle farm, his mother spent summers working at Turfway Park and his grandfather was a horse trainer. “And every time he sold a load of hay off our farm, that was an economic impact,” he said. “People forget Kentucky is the eighth-largest producer of hay and a $300 million industry for us. It’s important to start connecting the dots. One of the jobs I do is to educate not just the public but the rest of the farm community about the $4 billion impact that the horse industry has. It’s about equipment sales. It’s about health and veterinary supplies, feed, hay, bedding, farm equipment, fuels, truck and trailer rentals. Craig Bandoroff, who with wife Holly started and operates Denali Stud in Paris and whose 25-year-old son Conrad is about to join them, is an example of the industry reality that Quarles described. “Especially in the Thoroughbred industry, when so much of the perception is we all are the Arab sheikhs or some of the other titans of industry who come in here,” Bandoroff said. “But so many of us are family-run operations that provide a huge economic engine to this economy. I looked at my financials last week. We spent $15,000 this year on seed. We have a mowing contract that’s tens of thousands of dollars. Hay, straw, not to mention veterinarians and blacksmiths. That’s the thing to really keep in mind and not lose sight of: The economic engine that this industry, every single farm, provides is very significant. Sales-tax equity: Who packs a horse in car as a ‘companion’? The bill passed by the Kentucky legislature and signed by Gov. Matt Bevin last spring classifying equines as livestock stops short of providing horses the same 6-percent state sales-tax exemption on feed, supplies and equipment in place for cattle, pigs, chickens, sheep, alpaca etc. Jay Ingle, an attorney with Jackson Kelly law firm, said in his legislative update said he found 18 different sections in Kentucky’s statutes that were impacted by the change. Ingle said provisions and clarifications that impact horses include water resources, highways and transportation (including vehicle licensing and exemption for maximum weight) and pesticides, along with easements and economic grants for agri-business through the Kentucky Economic Development Finance Authority. “Others see it as the possible next step to sales-tax equity,” he said. Frank Penn, a KEEP board member and owner of Lexington’s Pennbrook Farm, called the legislation “a good first step” toward just that. “Equine has been known as a companion animal in the state of Kentucky for a long time. I have a yet to meet anybody who took their horse in the back of their car and went by McDonald’s for a burger, let alone took them in the house with them,” Penn said. “We’ve been fighting this for fifteen years. It’s very important what Senators Robin Webb and Damon Thayer did (getting the bill passed) that let’s us classify equine as animal production, as production agriculture. Why should we be called production agriculture? Because we sell forage through our horses, just like cattle and sheep do. Thayer, the Kentucky Senate Majority Floor Leader, told the conference that he expects tax reform to be addressed in the 2018 regular legislative session. Referring to walking-horse enthusiast Linda Starnes’ plea to keep the Kentucky Breeders’ Incentive Fund in tact because of “how important it is in trickle-down effect” for non-racing breeds, Thayer vowed: “I will lay my body down on the track to make sure that the Breeders’ Incentive Funds do not go back into the General Fund. The good news is that, unlike when I joined the General Assembly 15 years ago, there are a lot of advocates like Chairman Adam Koenig (chair of the House’s powerful Licensing, Occupation and Administrative Regulations Committee and who attended the conference), Speaker Pro Tem David Osborne, Senator John Schickel, Senator Steve West and others I believe will work with me to ensure those dollars continue to be reinvested” in the various breed funds to expand the overall horse industry. Penn closed with noting that the inequity between charging sales tax on feed and equipment used for equines and not for other livestock puts feed and equipment companies near Kentucky’s borders at a huge disadvantage with their competitors just across the state line. Denali Stud owner Craig Bandoroff said about six or seven years ago he contemplated opening a New York satellite breeding operation because Kentucky was suffering from an exodus of broodmares from the state. Today he said his Paris farm is at capacity and can’t take anymore horses unless Denali acquires more land. Historical horse racing, a topic of one of the KEEP conference panel discussions, is the innovative technology that provides a different betting experience through game terminals that use the parimutuel system that is the crux of American wagering on racing but with results based on the outcome of previously-run races. Since Kentucky Downs put in the Commonwealth’s first HHR terminals in late 2011, the track’s purses have skyrocketed to the highest in America, with Ellis Park soon afterward getting its own operation, Keeneland and The Red Mile launching a joint Lexington venture two years ago and Churchill Downs building a $60 million facility scheduled to open next year. Turfway Park also is working on plans to install the games. Bandoroff noted that while the mares bred in North America have dropped significantly, the Kentucky population has increased, from 15,636 in 2011 (39.4 percent of overall population, according to The Jockey Club) to 17,862 (more than 50 percent) last year. While the Kentucky Breeders’ Incentive Fund is largely funded by the 6-percent sales tax on stud fees, Bandoroff pointed that historical horse racing also contributes and is a reason for an 8-percent increase in the fund. The Kentucky Breeders’ Incentive Fund provides financial incentives to breeders whose horses go on to win the better races in Kentucky and in important stakes throughout the U.S. and world. It also funds the Kentucky Sire Stakes in standardbred racing and the Kentucky Horse Breeders’ Incentive Fund that provides money to non-racing breeds, providing revenue for shows, trails and facilities improvement. An example he provided: the top four finishers in England’s Group 1 Dewhurst for 2-year-olds were bred in Kentucky. Bandoroff said that historical horse racing has been a game-changer for Kentucky, with Ellis Park exhibit No. 1. With its own HHR operation still evolving, Ellis Park is coming off two transcendental meets thanks to a transfer of $3 million in purses and Kentucky-bred purse supplements from Kentucky Downs, done in collaboration with the Kentucky Horsemen’s Benevolent & Protective Association that represents owners and trainers at the Commonwealth’s five Thoroughbred tracks. Corey Johnsen, Kentucky Downs president and KEEP chairman, said major advancements in parimutuel wagering generally have a 10- to 15-year span from inception to really taking off. He says that’s where historical horse racing is now. “Historical horse racing started in 2001 at Oaklawn Park in Arkansas,” Johnsen said. “The first real step forward, in my opinion, was 2011 at Kentucky Downs. So what I see is that historical horse racing over the next 10 to 15 years is going to grow exponentially and is going to be an economic driver like simulcast wagering, like ADW. I think the next big step is going to be historical horse racing. “Why do I think it’s such a great development? Well, here’s the difference between historical horse racing and casino gambling: The fact is that it’s our product. It’s parimutuel wagering on historical horse races. It’s not something you can take away or offer some other place. You’ve got to offer it at racetracks. So we have greater control over what happens with the revenues, and we can invest those back into the industry, like we do with other parimutuel wagering. Katherine Paisley, General Counsel and Vice President of Compliance for the historical horse racing games-provider Exacta Systems, agreed that statistics show that historical horse racing is a new revenue source, rather than cannibalizing from the existing revenue streams. Paisley said annual betting on live racing in the United States has held steady at between $10.55 billion and $10.88 billion since 2011, but that historical horse racing handle has gone from $171 million in 2011 to $1.1 billion in 2016. That’s while being meaningfully conducted only in Kentucky, Wyoming and Oregon, with Arkansas now having very few HHR terminals, she said. “That’s 10 percent of the handle in the country being wagered from three states — and three states that aren’t offering the wager at every facility,” she said of combined wagering on live and historical horse races. With a large assist from historical horse racing, money going into the Kentucky Thoroughbred Development Fund has almost doubled since 2010, from slightly more than $4.5 million to approaching $9 million. KTDF, funded by a percentage of betting, provides purse supplements to the owners of registered Kentuckybreds competing in maiden-special weight and allowance races at the commonwealth’s tracks, which have the option of using that money to also enhance stakes purses, as Kentucky Downs has done to great effect. Jamie Eads, Executive Deputy Director of the Kentucky Horse Racing Commission, also said in her KEEP conference presentation that nearly $130 million has been distributed since 2006 through the Kentucky Thoroughbred Breeders’ Incentive Fund to the breeders of registered Kentucky-breds that win certain types of races in the state and designated races throughout the country and world. That fund comes from the 6-percent sales tax on stud fees when a mare is bred to a stallion. Eleven non-racing breeds in Kentucky have received almost $10 million since 2006 through the Horse Breeders’ Incentive Fund. The vast majority of that comes from the HBIF receiving 7 percent of the total assessed from the 6- percent state sales tax on stud fees, almost all of it from breeding mares to Thoroughbred stallions. “I don’t know if there’s another state that shares the Thoroughbred money with the other breeds, but I think it’s something that makes us a much-stronger industry,” said Corey Johnsen, the Kentucky Downs president and KEEP chairman. Conference moderator Alan Balch, who has almost 50 years in the horse business and ranks among the most-respected executives in both racing and the show-horse world, pointed to the 1984 Olympics in Los Angeles as a textbook case of breeds helping each other. “The all-time biggest year we had at Santa Anita was the year of the Olympics,” said Balch, who was senior vice president at the track as well as the Los Angeles Games’ competition director for the Olympic equestrian sports staged at Santa Anita. “And I have no doubt that it was because of the synergy among all types and pursuits of horses. 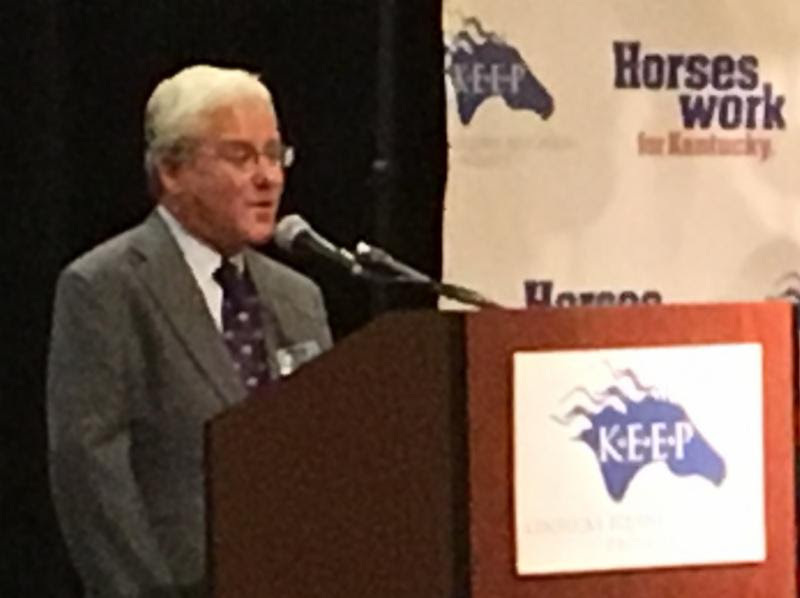 Balch used his impassioned pitch for breeds working together as the prelude to the late Tim Capps being honored with the KEEP Vision Award for outstanding contribution to the overall horse industry. Capps served with distinction as a turf journalist and publisher, breeding and track executive before joining the University of Louisville’s Equine Industry Program in the College of Business, for which he became the director in 2011. KEEP and the University of Louisville’s interim program director Terri Burch, announced the launching of the Tim Capps mentoring internship where the winning U of L equine student will have monthly meetings with KEEP board members and hands-on experiences to get insight and connections with all facets of the equine industry. The 36-year-old non-profit Central Kentucky Riding for Hope, located at the Kentucky Horse Park, was honored with the Vision Award for an organization. Executive Director Pat Kline observed that CKRH has been the recipient of KEEP grassroots grants for its array of programs making life better for children and adults with special physical, cognitive, emotional and social needs while using horses as the conduit. Eric Hamelback, Chief Executive Officer of the National Horsemen’s Benevolent & Protective Association, asked Bryan Brendle, the Washington D.C.-based American Horse Council’s Director of Policy and Legislative Affairs, about getting racetrack stablehands classified as agriculture employees, which would have a significant impact on visas for guest-worker labor. Currently backside employees are in the same category as landscapers, roofers, etc. Developing a domestic workforce prepared for all capacities of the industry is increasingly important with the uncertainty over federal immigration policy. A KEEP conference panel featured four entities working to alleviate the problem: NARA, U of L, the University of Kentucky and Locust Trace, a magnet school in Fayette County that opened in 2011 and offers six agricultural pathways, including equine studies and a veterinarian tech program. 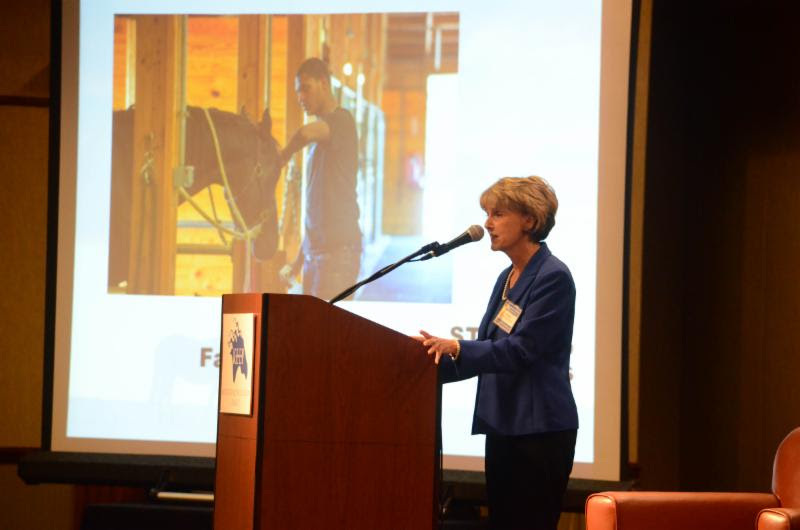 Kristen Branscum, commissioner of the Kentucky Department of Tourism, challenged the equine industry to come up with new ways to broaden its reach into attracting out-of-staters and foreign visitors to the Commonwealth to grow an overall tourism industry that in 2016 produced $14.5 billion in revenue. Conference moderator Alan Balch, an executive in both racing and the showhorse world, pushed for renewed commitment to marketing in its various forms. “I’ve seen a shift come back in racing everywhere, including Kentucky, frankly, to an accounting mentality,” Balch said. “…. Accountants love to count those beans and put them in the bank. We marketers do not look at marketing as an expense but as an investment. But marketing is an investment you cannot depreciate. The presentation will take place during the lunch program at the Equine Industry Conference on October 16 at the Embassy Suites. 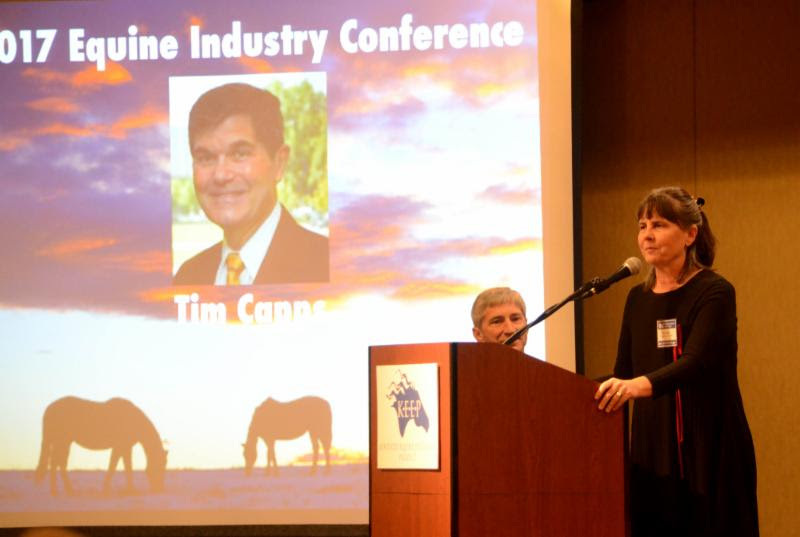 LEXINGTON, KY — The late Tim Capps and Central Kentucky Riding for Hope will be honored with the Industry Vision Awards during the Kentucky Equine Education Project’s second KEEP Equine Industry Conference this Sunday and Monday at the Embassy Suites Hotel in Lexington. The Industry Vision Awards — which recognize an individual and an organization for outstanding contributions to the equine industry — will be presented during Monday’s luncheon. Capps, the University of Louisville’s Equine Industry Program director who died April 22 at age 71, was among the industry’s most knowledgeable and respected voices, having worked as a racing and breeding executive, turf journalist and an industry analyst before joining the College of Business’ equine industry faculty in 2006 and becoming director in 2011. Capps at various times was The Jockey Club’s director of operations, editor and publisher of The Thoroughbred Record, vice president of Matchmaker Racing Services and executive vice president of the Maryland Horse Breeders’ Association, the Maryland Million and the Maryland Jockey Club. He also wrote books in Eclipse Press’ Thoroughbred Legends series about Secretariat, Spectacular Bid and Affirmed and Alydar’s legendary Triple Crown rivalry. Central Kentucky Riding for Hope is dedicated to enriching the community by improving the quality of life and the health of children and adults with special physical, cognitive, emotional and social needs through therapeutic activities with the horse. CKRH, located at the Kentucky Horse Park, started as a grassroots effort in 1981. It is a Premier Accredited Center of PATH Int’l (Professional Association of Therapeutic Horsemanship International). CKRH and its approximately 30 horses service 12 counties. CKRH also provides clinical/intern opportunities for UK Health Sciences, Eastern Kentucky University, Asbury University, Markey Cancer Center and Midway College Equine Program. The Industry Vision Award recipients are selected from nominations provided to a committee assembled by the KEEP Board or Directors. Last year’s inaugural winners were KEEP founder Brereton Jones and Old Friends Thoroughbred retirement farms. “Few people have been such a positive and progressive force for the entire equine industry or in as many capacities as Tim Capps,” said Joe Clabes, KEEP’s executive director. “It’s heart-breaking that we were unable to recognize him before his untimely passing. His legacy lives on in many ways, including the influence he had on his students and future leaders produced by the University of Louisville’s equine business program. “The aptly-named Central Kentucky Riding for Hope provides an invaluable service for countless families, with its wonderfully compassionate instructors and horses providing immeasurable benefits for their riders, young and old. The special bond between horse and rider has an uncanny way of helping participants not only with physical but cognitive and emotional issues, including instilling a sense of pride, companionship and self-esteem. They represent an outstanding example of the many ways horses provide tangible benefits to the lives of Kentuckians. The two-day Equine Industry Conference will bring together representatives of all breeds and disciplines, legislative and regulatory policy-makers and emerging leaders from across the Commonwealth. The conference begins Sunday afternoon with partner organization meetings and a communications workshop designed to help horse breeds and organizations get more exposure and attract new enthusiasts by embracing the Internet and social media. An evening welcome reception will provide networking opportunities with industry leaders and state legislators. Some of the most influential and knowledgeable people in the industry will join Monday’s panel discussions, including Kentucky Commissioner of Agriculture Ryan Quarles, Kentucky Tourism Commissioner Kristen Branscum and American Horse Council Director of Policy and Legislative Affairs Bryan Brendle. The program is designed to inform and promote constructive discussion about strategies for protecting and growing Kentucky’s horse economy. Topics will include the horse industry’s impact on Kentucky’s economy, state and federal legislation, the success of historical horse racing in strengthening year-around racing and workforce development challenges. Monday’s panel discussions will be moderated by Alan Balch, one of the best-known executives in both the racing and show-horse worlds. Registration for the conference is $75, which includes the Sunday reception, Monday’s continental breakfast and lunch. College students can have the fee waived by using the code STUDENT100. KEEP also offers a lunch-only registration special for $40. Additional information available online at: www.horseswork.com. The Kentucky Equine Education Project is an all-breed grassroots organization created in 2004 to preserve, promote and protect Kentucky’s signature horse industry. Support for KEEP’s activity comes directly from the horse industry and horse industry supporters that we represent. To learn more about how you can become a member or make a contribution, please visit www.horseswork.com.